The Barnwell Site is an active archaeology site in Beaufort County on Hilton Head Island. 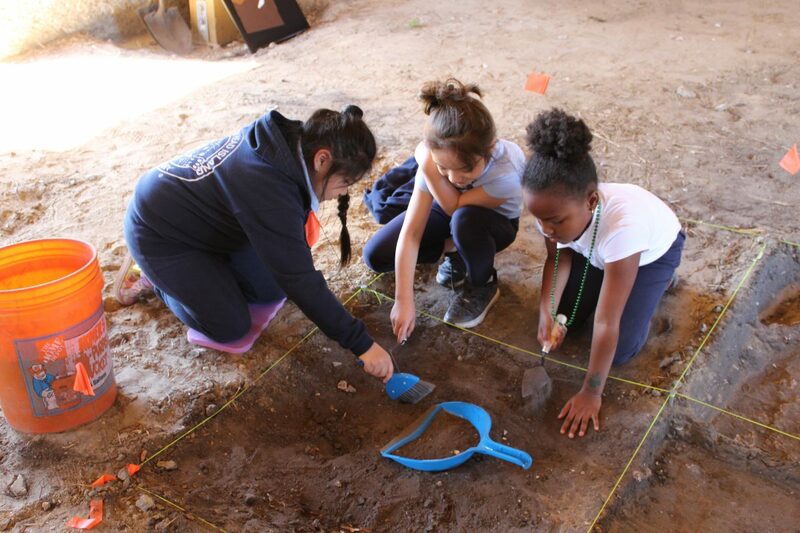 The ongoing Barnwell Archaeological Research Project is a partnership between several organizations, including the SC Archaeology Public Outreach Division (SCAPOD) and the University of South Carolina Beaufort. SCAPOD will coordinate the public outreach components for the property, including visits from school groups and a Public Outreach Day for the general public on Saturday, April 13, 2019 that will include scholarly talks and tours. SC Humanities supported this program with a Mini Grant. The Barnwell archaeology site is a tabby ruins dating to the antebellum period that was part of the 19th century Cotton Hope Plantation. Excavations aim to determine the date of the structure’s construction and the structure’s use, especially how enslaved African Americans were involved. On March 18 & 20,2019, nearly 200 3rd graders from Hilton Head Island Elementary walked from their school to Mr. Thomas Barnwell, Jr.’s property to learn about a historic Tabby Structure. Dr. Kim Cavanagh, assistant professor of anthropology at USCB, & Dr. Audrey Dawson, archaeologist, are working with University of South Carolina Beaufort students as part of their Principals of Archaeology class in order to answer the following questions: 1. When was the structure built?, 2. How was it used? and 3. How were enslaved people involved? Dr. Cavanagh has invited local schools to visit the site for a day of education. During the visit, Dr. Cavanagh, along with USCB students, taught the 3rd graders about island history, archaeology, stratigraphy, artifact identification, and excavation. The third graders were given the opportunity to participate in actual excavation inside the Tabby Structure. Dr. Cavanagh will be hosting a Public Day on Saturday, April 13th from 10 am to 2 pm. Activities will be planned for all ages. These educational opportunities were made possible by funding from Mr. Thomas Barnwell, Jr., University of South Carolina Beaufort, South Carolina Humanities, Community Foundation of the Lowcountry, and South Carolina Archaeology Public Outreach Division (SCAPOD). To access the site, drive down Squire Pope Road to the traffic circle. Take the first right off of the traffic circle and turn right into the first driveway. For more information, please view the flier. The mission of SC Humanities is to enrich the cultural and intellectual lives of all South Carolinians. Established in 1973, this 501(c) 3 organization is governed by a volunteer 20-member Board of Directors comprised of community leaders from throughout the state. It presents and/or supports literary initiatives, lectures, exhibits, festivals, publications, oral history projects, videos and other humanities-based experiences that directly or indirectly reach more than 250,000 citizens annually.